Your tires support your vehicle through a rather complex steering and suspension system. If a wheel isn’t properly aligned with respect to the frame and the other wheels there will be excessive wear as well as poorer handling. Alignment services aren’t part of vehicle maintenance packages, so they’re often neglected. But by some estimates, half of all cars on the road would benefit from a wheel alignment service call. Given time rough roads and potholes can push things a bit out of whack. Tire alignment problems can also occur as a result of an accident or simply striking a curb. 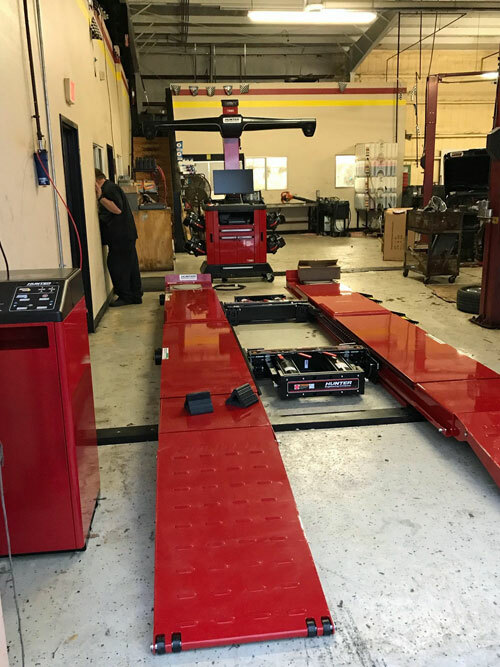 So in addition to wheel balancers, tire dealers and auto shops have advanced alignment systems to measure complicated 3-D angles so a mechanic can make adjustments to bring everything back into spec. The primary angles are referred to as caster, camber, and toe. Depending on the vehicle’s steering and suspension secondary angles can include frame angle, included angle, maximum turn, ride height (front and rear), setback, steering axis inclination, toe turn change, track width difference, turn toe out, and wheelbase differences. Needless to say, getting everything all lined up together makes the alignment process more than a little complex. Today’s systems use camera heads attached to each wheel. They’re pointed to an alignment tower with precision light sources, and the central computer calculates angles from the digital images. Changes in alignment can interact with anti-lock brakes, traction control, electronic stability control, adaptive cruise control, and lane-departure warning so that work on the latest vehicles also requires an understanding of these systems as well. Various experts have suggested alignment checks ranging everywhere from 3 months or 3,000 miles to 36,000 miles or 3 years. So it’s a good idea to be aware of the signs that it might be time for a wheel alignment check. Those symptoms include your vehicle pulling to the left or right as well as the steering wheel not being centered when driving straight forward. You may also notice unusual vibrations when steering (although that could also be a wheel balance or power steering pump problem). Misalignment also shows up in uneven tire wear, especially differences between interior and exterior threads. Tire rotation balances that wear, but doesn’t fix the original cause! There’s no need to make a separate trip to a tire shop when it’s time for maintenance. Our wheel alignment service just got even better. 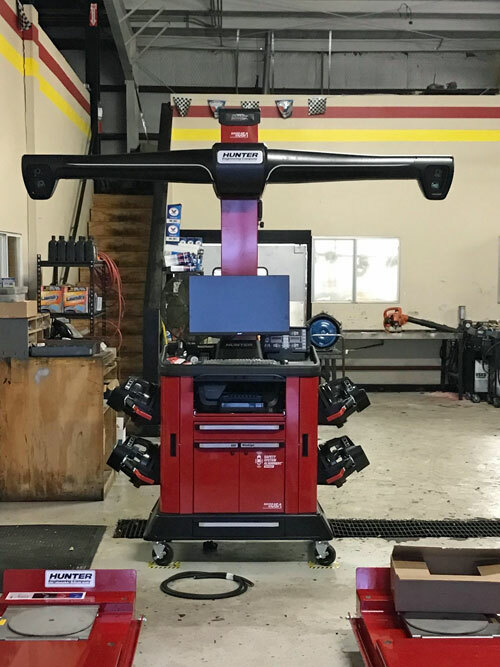 We’ve recently added the latest and greatest in wheel alignment equipment to our shop, the HawkEye Elite®. With patented tire-grips and precision cameras, it lets us provide the fastest and most precise wheel alignment service there is. You’ll get a complete printout of before and after data. Not to mention longer tire life, better gas mileage, and a better ride. We’re dedicated to the best in old-school personalized customer service, and employ ASE-certified mechanics for top quality work.